Mission Australia’s latest Youth Survey Report shows that 15 to 19 year olds believe that equity and discrimination are one of the top three issues facing Australia today. Over one quarter of young people who participated in the survey indicated that they had experienced some form of unfair treatment or discrimination in the last twelve months, due to their gender (39%) and race/cultural background (31%). Half the young people surveyed had witnessed someone else being unfairly treated or discriminated against in the last twelve months, most commonly on the basis of race/cultural background (58%) and sexuality (41%). These concerning statistics undoubtedly reflect broader societal trends both here in Australia and abroad. Providing a platform for young people to voice their opinion and feel empowered to address these issues is needed. Introducing gender equality workshops to address gender stereotypes in schools was one of the ‘Big Ideas’ that students who participated in the AEF’s Go Global Youth Forums identified last year. This forum invites students from a range of schools to use structured design thinking to explore ways to help achieve the United Nation’s 17Global Goals for Sustainable Development that world leaders agreed to in 2015. "It was interesting getting to know people who also have an active opinion and to work with them." The solutions that students designed had a strong focus on young people from a comprehensive nutrition and physical education program for schools to a federal government program around jobs of the future and the introduction of a NAPLAN-like test for work skills. This resonates with recent research published by the Foundation for Young Australians in its New Work Order series. In our increasingly diverse world, understanding difference is essential if we are to tackle rampant discrimination. The AEF’s Australia-ASEAN Youth Forum invites students to walk in the shoes of Southeast Asian country leaders. This challenges students to ‘see things from a different perspective’ and ‘doubt [their] own beliefs in a good way’, as Kelly Phan from Bendigo Senior Secondary College aptly describes. 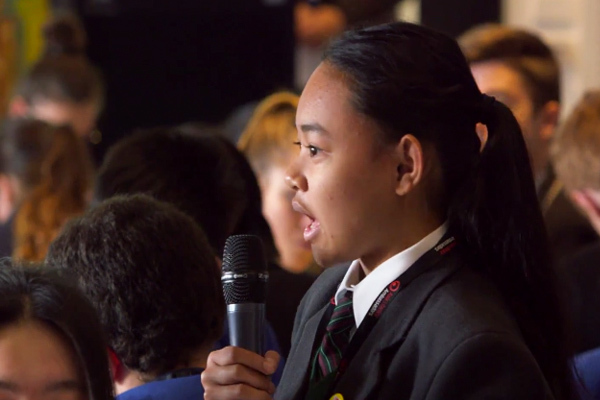 Watch teachers and industry experts explain why it's important for Australian students to learn about our ASEAN neighbours. Students are asked to use their negotiation and consensus-building skills to make recommendations to address South East Asia regional issues such as climate change, forced migration and the impacts of trade. Ideas developed by students who have participated in the Australia-ASEAN Youth Forums revolve around ensuring all the countries they represented reach the same standards. For example, Australia and ASEAN Member States would all provide climate education to share the latest climate research, run human rights training for people working with refugees or establish an education fund to achieve minimum education standards across the region to improve employability, productivity and trade. AEF’s Go Global Youth Forums are challenging and inspiring and acknowledge young people as active leaders of change. It’s time to listen to what young Australians have to say about the world they want. Our current students are the generation that will shape our future. To find out more about our upcoming youth forums, student engagement opportunities, or to express interest in hosting a program with your school community please visit our Go Global page or contact Go Global Project Office, Emeline Gillingham. Image acknowledgement: Infographic from Mission Australia. Download the full report here.